Yet another high volatile day in the market with two sided auctions. Price opened above previous day spike and went testing the Thursdays failed auction reference level 10586. 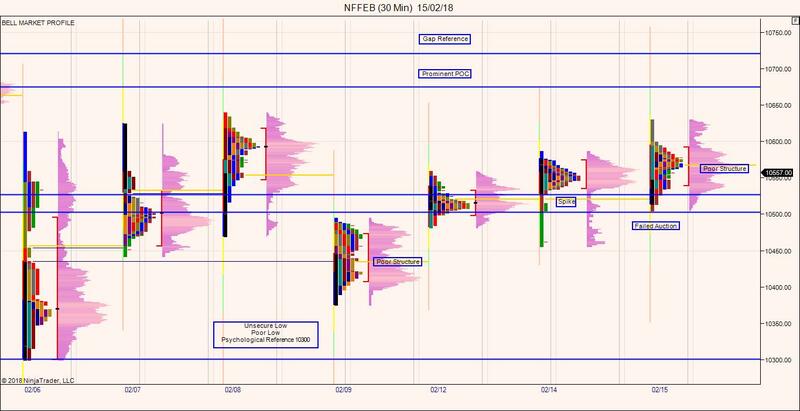 Later on price traded in a compressed ontimeframe against the IB direction more of day timeframe players participation with stops built at day high. Mid of the Day – stop hunting above the day high stops forms a nice clean excess (Excess indicates end of one auction and beginning of another auction) on the daily profile. Post excess formation markets are dominated by Wider rotations, day low test is done in the last 45min of trading. Price manages to close above spike end of the day. So far price closed with positive sentiment with failed auction formation at day low 10504. Value formed overlapping relative to previous trading day. However for the odd trading perspective downside risk is increasing though 10500 remains as the downside expiry support (10500PE writing happening and writers are strong over there). Downside odds of testing 10300 is increasing due to unsecured low + poor structure combinations on the downside. 2)Poor Structure formation on last Friday(9th Feb) and on thursday trading. 3)Prominent POC formation at 10675 on 5th Feb 2018. Spike Base at 10527 is likely to act as monitor for support. Any price acceptance below 10527 will bring a potential test towards 10300 and 10100 reference. Price holding above 10527 will manage nifty in a broader range between 10527-10640. Weekly gap & the spike reference at the top around 10725-10814 might act as a intermediate resistance band which is not quiet easy to penetrate for this series.